I've been making this recipe for fifteen years, so it's a true keeper. It comes together quickly, has amazing flavor, and is kid-friendly. Recently I made it with a side of roasted spaghetti squash and some tossed salad. Delicious. Combine the bread crumbs, garlic salt, onion powder in a small bowl. Combine mustard and butter in a separate bowl. 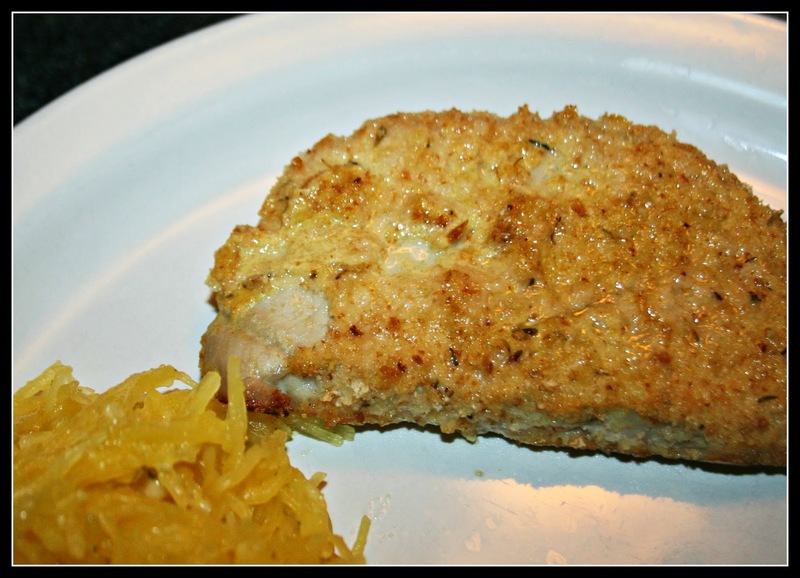 Brush mustard and butter over pork chops, then coat with crumb mixture. Bake at 425* for 15 minutes in a shallow baking pan. If you buy large pork chops, you will need to bake them for a longer period of time. I tend to cut in the middle to make sure there is no pink. If you're looking for something easy but unique for the dinner table, give this a shot. It's always a hit at our house. Hi Lisa, The pork chops look delicious and I like the easy recipe. Hope you enjoy the day! I will have to experiment with that as mustard is something I haven't associated with pork chops though I don't know why as honey mustard works with chicken. I'm making pork chops tonight so will be trying this! Looks good and easy...those are my kind of recipes! Thanks for sharing. I'm all for easy and delicious:) This looks so good for winter! Looks so good... makes me wish it were dinner time instead of only breakfast time.... but this would work for breakfast too... right??? This does sound--and look--good. I like the flavor that Dijon mustard gives. Larry would love this. He has been doing some cooking, so I'm going to share with him since I don't usually cook meat. Would this work on chicken too? Looks delicious and healthy! Thank you for sharing. I love using Panko crumbs! They work great for giving a really crispy crust. That looks so yummy! I'll definitely be trying that recipe soon. You know, I just tried that recipe for the first time a month ago and my guys loved it--was it in the PIllsbury cookbook? Anyway, yes, it is a keeper. Looks tasty. I'm going to try these! looks delicious! I bet the mustard adds just enough flavor kick! Stopping over from Nancy, A Rural Journal to check out your pork chop recipe. Copied and saved . . . sounds yummy, we will try it this weekend! Looking forward to trying this recipe. Stopping by from A Rural Journal!